IMPORTANT: Read and understand these instructions before attempting to install the TOEKICKswitch. Failure to do so may result in injury or death. Click to Print Instructions. The TOEKICKswitch footswitch is designed to be installed on garbage disposals rated at 1hp or less. Garbage disposals with motors greater than 1hp may not function correctly, or damage the switch mechanism. 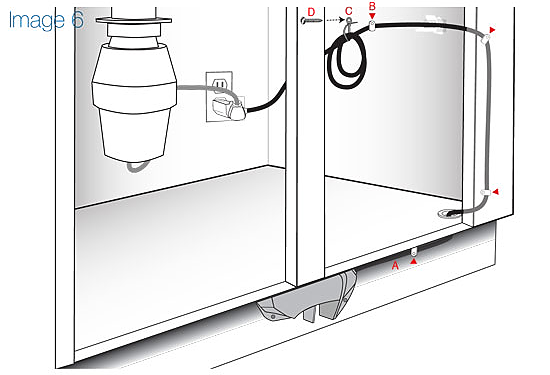 A grounded receptacle/outlet must be located within 6 feet of the installation point of the TOEKICKswitch. 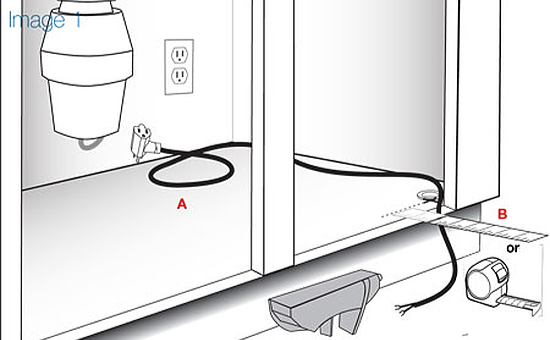 Should the receptacle/outlet not be properly located, have one installed or relocated by a qualified electrician. WARNING - DO NOT PLUG IN THE POWER CORD BEFORE PROPERLY CONNECTING WIRES TO SCREW TERMINALS AND SECURING ELECTRICAL ACCESS COVER. Determine TOEKICKswitch location - Place the the TOEKICKswitch flush against the toe kick and base cabinet to verify fit. 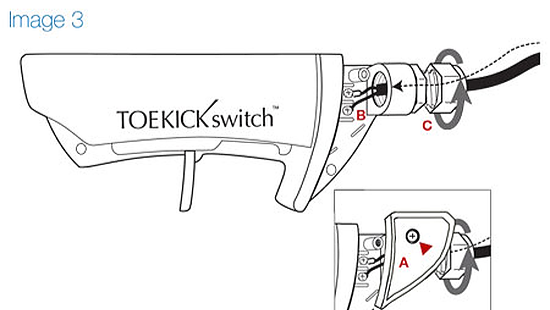 Final switch location will be centered in the toe kick (see Image 1). Extend cord (A) to insure adequate length between wall outlet and TOEKICKswitch. Verify that wall switch is "OFF" before proceeding. To locate the position of the hole place the ruler or tape measure against the toe kick. Measure the depth. Transfer the note depth to the top of the cabinet (C). Next divide the depth in half and mark the location with a pencil. Measure 2" inward from the side and mark again. Draw a line intersecting the two marks. This is the hole location. Using the provided 13/16" drill bit(A), bore a hole through the floor of the base cabinet. Remove any debris and insert Cabinet Bushing in to the drilled hole(B). 1. Remove the single phillips head screw from the electrical. Pull the cover off and put it aside See Inset A). 2. Insert Piggyback power cord through the center of the strain relief (A) exposing the two “u” shaped wire connectors (B). Slightly loosen the terminal screws using a phillips screwdriver. “U”shaped connecter must slide beneath the terminal screws in order to make a proper connection. 3. Once the wires properly connected to terminals, use a phillips screwdriver to tighten terminal screws. Lightly tug on the wires. There must be no movement. 4. Hand tighten the strain relief by turning the nut in a clockwise fashion (see the above image). Double-check both terminal connections and the strain relief by lightly tugging on the plug end of the Piggyback power cord. There should be no visible movement at the terminals or strain relief. 5. Return the electrical cover to its original position. Tighten the electrical cover screw using a philips screwdriver. STEP 4 - CONNECTING THE TOEKICKswitch TO POWER. TESTING THE TOEKICKswitch. 1. Connect the switch to power by first attaching Piggyback power cord C into the outlet (A). 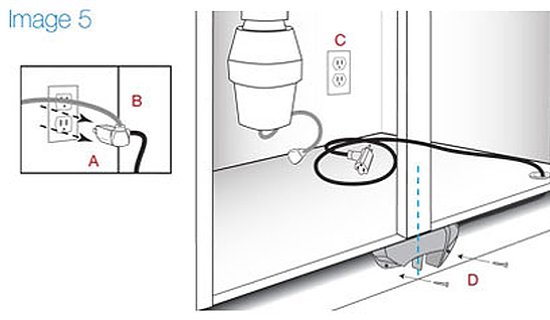 Next plug the disposal power cord (B) into Piggyback power cord (C). See image 4. 2. Place the wall switch into the "ON" position (if applicable). 3. Test by simulating the TOEKICKswitch activation movement. 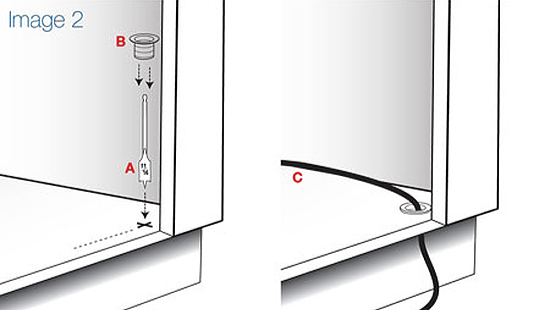 Using your hand, push the activation lever over and up until the disposal operates (D). 4. If the disposal fails to operate, switch wall power "OFF" (if applicable) and disconnect both the disposal and Piggyback power cord and check all electrical connections. 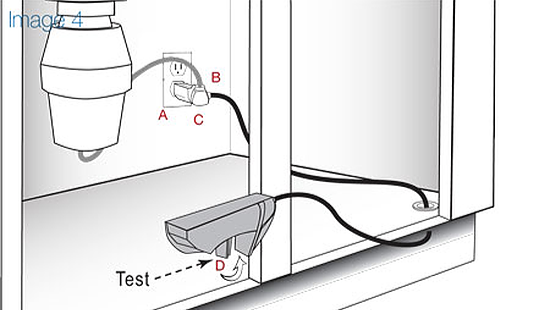 Unplug both the power cord from the disposal (B) and the Piggyback power cord (B) connecting to the TOEKICKswitch. See Inset Center the TOEKICKswitch on toe kick. It should be making contact with both the toe kick and the underside of the base cabinet (D). Using a power drill and and a phillips screw driver bit, attach the TOEKICkswitch to the atoe kick using the provided screws. Remove the slack in the Piggyback power cord in the toe kick (A). Using a hammer, place Piggyback power cord staples underneath and inside the cabinet. See (B) red arrows. Collect any excess Piggyback power cord. Wrap it in a coil-like fashion. Secure the coiled Piggyback power cord with the provided zip tie (C). Using a power drill and a phillips bit, attach the zip tie to the inside of the cabinet with screw (D).